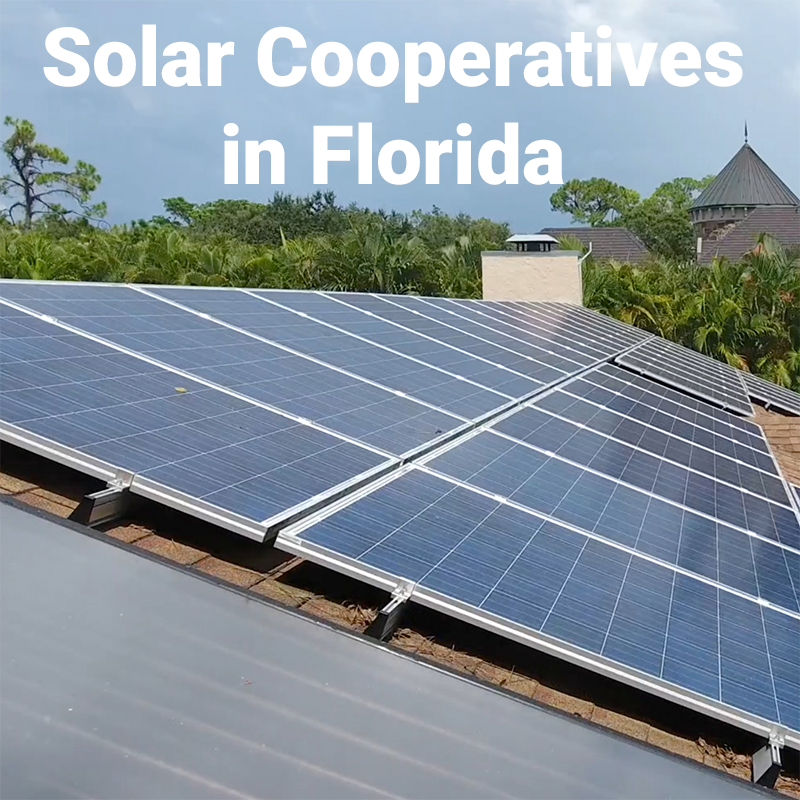 Solar cooperatives, or co-ops, are organizations set up to empower neighbors to get the best prices and products when buying solar panels for homes and businesses. The concept is that pooled interest will result in lower prices, peace-of-mind in selecting a contractor, and pre-screened products. 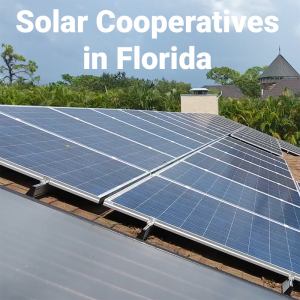 There are advantages to solar co-ops in Florida, but there are also serious potential drawbacks that you should be aware of. We have been part of successful co-ops before, so we know the pros and cons well. Most solar co-ops select a single contractor, limiting options for selecting more experienced or better-skilled installers. Since price is often a large factor in selecting a contractor, quality may suffer. Contractors may make wild promises and price systems below sustainable rates just to win the bid. You may not get the best price with a solar co-op. Organizers often charge a substantial fee to the contractor for marketing the program and organizing potential co-op members. This cost directly impacts the final price to the consumer. Furthermore, the contractor that offered the best value is often not selected. Your choices in materials will be limited. For example, if you want microinverters versus solar optimizers or string inverters, your program may not be geared toward this option, and pricing of options may not be attractive. Roof attachment methods will be limited to the products offered by the selected contractor. The contractor chosen for a co-op is often not locally owned or managed. Laborers may come from a long distance to complete your project, and may not be familiar with your permitting jurisdiction. More importantly, what happens when you have a service issue in the future? Do you expect fast and efficient service from an out-of-town contractor, if they are still around even? Your installation timeframe may be drawn out. Solar contractors selected for co-ops need to install dozens or even hundreds of systems that were contracted in a short timeframe, so scheduled installations may be months away. In order to meet the low cost of the winning bid, the contractor may “cookie-cutter” your system, without regard to your particular home, energy use, or circumstances. A full consultation and careful consideration are advised for anyone considering solar energy. The selection committee may focus on factors that are not particularly important. Focusing on price without regard to quality is an obvious risk given that committee members will think very hard before selecting a higher priced option. Another example is warranty. Warranties are only valuable if backed by a financially secure company, a factor that is rarely investigated in selection criteria. Upgrades, up-charges, and other fees not included in the base price for the co-op may result in higher prices for your finished project. Other solar energy products and energy efficiency options, like solar pool heating, variable speed pool pumps, and heat pump water heaters, are often ignored by these programs. These products often represent a better return on investment for homeowners. The winning contractor has no incentive to point out these options. First and foremost, you can get a second opinion! It is highly likely that you can get the same price from another qualified contractor (because they are not subject to the restrictions and fees imposed by a co-op program administrator). You can likely get a better value, too. The base bid in a solar co-op is designed to be a winning bid by the selected contractor, but that may not represent the best value, and upgrades may be costly. Solar co-ops are a great idea in theory. Pooling resources should work at lowering prices, and it does. However, this industry has become so competitive that co-ops are no longer effective at significantly reducing prices. Solar panels are now a commodity. The panels themselves are a small percentage of the installed cost of a solar energy system. You are paying for the experience of the contractor installing your system, and there is no doubt that you get what you pay for. What solar co-ops do great is educating consumers and sparking interest in solar energy. They do not guarantee that you will get the best price, the best products, or even the best value.